The National War Tax Resistance Coordinating Committee (NWTRCC) is looking for applicants for its Outreach Consultant position, to start January 2019. NWTRCC, founded in 1982, is a national coalition of organizations and individuals who work together to support, coordinate, and publicize war tax resistance efforts. Responsibilities for the position include promoting NWTRCC on social media, helping to manage NWTRCC’s websites, and some field organizing. Some travel is required for the position (two NWTRCC conferences per year (usually first weekends of May & November), plus some organizing trips that can be scheduled around the consultant’s availability. A successful candidate will possess social media & web-based talents, be skilled at writing & working independently, enjoy working with a wide variety of personalities, have demonstrated public speaking skills, and have experience in and commitment to war tax resistance. The Outreach Consultant will work closely with the NWTRCC Coordinator. The position will average 18 hours per week. Compensation is about $21 per hour (about $20,000 per year). NWTRCC is actively committed to affirmative action/equal opportunity criteria in hiring. 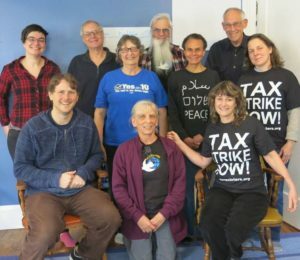 The National War Tax Resistance Coordinating Committee (NWTRCC) is a coalition of groups and individuals from across the U.S. founded to facilitate networking among organizations involved in war tax resistance and to provide information and support to individuals who refuse to pay for war. NWTRCC sees racism, sexism, homophobia, poverty, economic exploitation, environmental destruction, and militarization of law enforcement as integrally linked with the militarism which we abhor. NWTRCC promotes war tax resistance within the context of a broad range of nonviolent strategies for social change, and is firmly embedded in the peace movement.